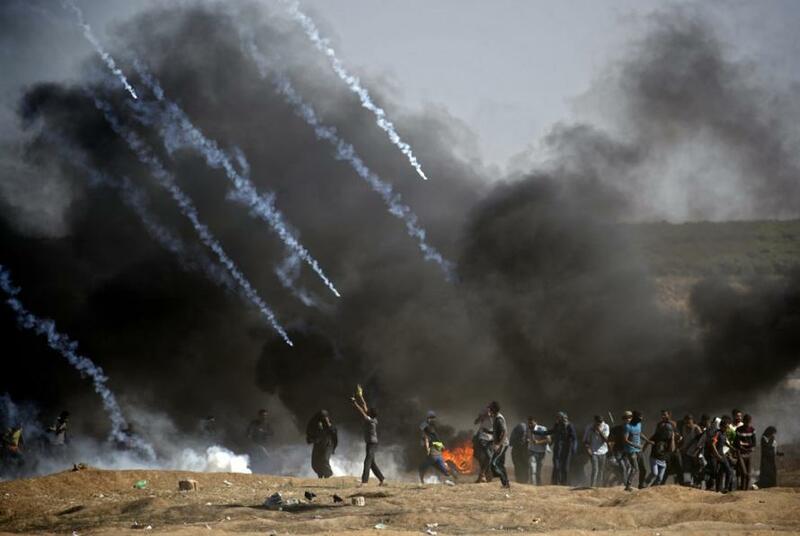 The United Nations Human Rights Council (HRC) just issued a stunning rebuke to Israel, voting through a resolution calling on the council to "urgently dispatch an independent, international commission of inquiry... to investigate all alleged violations and abuses... in the context of the military assaults on large scale civilian protests that began on 30 March 2018," while the UN human rights chief slammed Israel's "wholly disproportionate response." The UN's top human rights body passed the resolution with 29 votes in favor, two opposed and 14 abstentions. The two HRC members in opposition were the United States and Australia (the UK abstained), with Israel condemning the vote, which was proposed by a group of countries including Pakistan. Both the US and Israel criticized the resolution's language for failing to mention Hamas — the militant group ruling over Gaza — which Israel blames for the scores of civilians killed during the 'Great March of Return' protests. On Monday 60 Palestinians were gunned down by Israeli live fire as protesters approached the border fence area. The following day U.N. leadership issued a scathing critique of Israel's actions, with the U.N.'s human rights commissioner identifying women, children, journalists, first responders and bystanders as among the dead. "We condemn the appalling, deadly violence in Gaza yesterday," said Rupert Colville, spokesperson for the U.N. High Commissioner for Human Rights. Though the U.N. commissioner acknowledged the Palestinians' attempt to break down and damage the fence that separates Gaza and Israel, he added that this did "not amount to a threat to life or serious injury and are not sufficient grounds for the use of live ammunition." And a day before Friday's HRC resolution vote Defense Minister Avigdor Liberman urged Israel to withdraw its membership in the United Nations Human Rights Council altogether, arguing that "Israel is under a double attack," and further that, "A terror attack from Gaza and an attack of hypocrisy headed by the United Nations Human Rights Council." Throughout the mass Palestinian protest along the Gaza-Israel border, which began on March 30th, Israel has maintained its stance that Hamas is purposefully provoking the shootings, even to the point of sending children and disabled to the fence near Israeli security positions, and hiding firearms among the crowd. However, the U.N. and a number of nations that have condemned the killings — some like South Africa even recalling their ambassador — aren't buying this as a valid explanation for the appalling death toll. But both the Israel and the United States appear to be shrugging off the stinging rebuke — a formal resolution calling for Israel's investigation which is somewhat rare for the council — and both countries have repeatedly accused the 47-member council of anti-Israel bias. Israeli ambassador Aviva Raz Schechter was quick to question the legitimacy of the body, calling the newly passed human rights inquiry "politically motivated and [it] won't improve the situation on the ground by even one iota." The Israeli ambassador further said blamed falls exclusively on Hamas' shoulders: "The loss of life could have been avoided had Hamas refrained from sending terrorists to attack Israel under the cover of the riots, while exploiting its own civilian population as human shields," she said, and added further, "It is Israel, certainly not Hamas, which makes a real effort to minimize casualties among Palestinian civilians." Schechter concluded, "It is regrettable that so many member states allow themselves to be misled by the false narrative of so-called peaceful protests." In addition to the 60 killed on Monday, Gaza's Ministry of Health stated that 1,703 Palestinians were wounded by live fire during Monday's events, which occurred the same day as the opening ceremony for the new US embassy in Jerusalem was underway, and which corresponded further with both Israel's 'Jerusalem Day' festivities, and the eve of Palestinian 'Nakba' day. Prior to this week's events, the UN Office for the Coordination of Humanitarian Affairs reported that by the end of April over 40 Palestinians had been killed and 5,511 were wounded after the first full month's protest. Despite global outrage and demands for justice, the U.N. inquiry will be slow going and is unlikely to satisfy any party to the conflict. What the resolution describes as an "independent, international commission of inquiry" mandated by the council will not produce its final report to be placed before the Human Rights Council until next March — nearly a full year away.